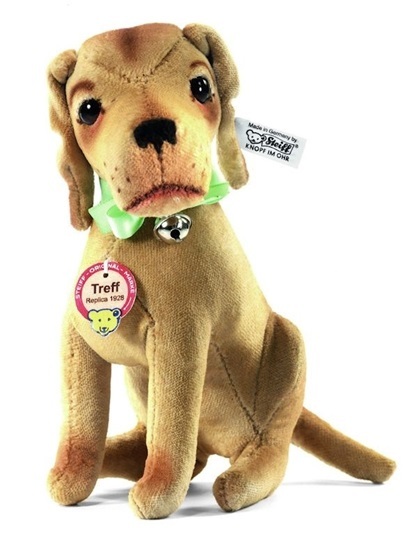 Steiff proudly introduces Treff an exact replica of the original 1928 dog. It doesn´t get any closer than this! Steiff's Treff replica is so close to the original, Steiff had trouble telling them apart. Steiff thinks you will, too! They have gone to great lengths to duplicate the original down to the last detail. From the intricate hand airbrushing to the patented, half-covered glass eyes, to the original light brown colored cotton velvet fabric, to the hand wood stuffing, Treff is simply wonderful - and very accurate in every way! Treff´s neck is jointed and he has wire in his front and back legs to help him sit properly - just like the original. Treff sets a new standard for replicas. Treff is limited to 1000 World Wide in 2013. He is currently sold out at the manufacturer. Treff is 5.5 inches tall, made of light brown cotton velvet, is a 1928 replica and Treff is a 1 way jointed dog, that can be surface cleaned.